Indicrat: Indicrat Policy On Religious Tests For Immigrants And Citizens. Indicrat Policy On Religious Tests For Immigrants And Citizens. If a U.S. citizen said that a very important requirement of his religion was to eat a human heart once a month, would Liberals allow it? Or would Liberals say there's a limit to that particular religious freedom? What if there were 5 million adherents of this hypothetical religion living in the United States and another 10 million living in other parts of the world? And some had the desire to immigrate to America. How would Liberals wish to process them into the country? Koran (8:12) - "I will cast terror into the hearts of those who disbelieve. Therefore strike off their heads and strike off every fingertip of them"
There are MANY kill commands in the Muslim holy book, far more than in the holy books of other major religions. Some adherents to this religion (Islam), commonly known as "Radical Islamic Terrorists", act on the commands of their religion. 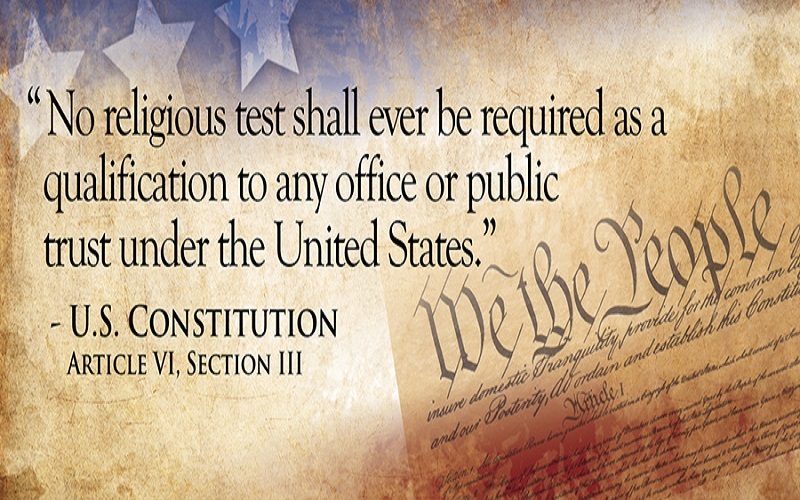 In U.S. we have "Freedom of Religion", but what does that mean exactly? We also have "Freedom of the Press" and "Freedom of Speech", but Liberals and Conservatives alike have settled on the premise that "Freedom of Speech" does not mean yelling "Fire!" in a crowded theater. There are LIMITS. We have limits to all our "Freedoms". But religions have physical rituals that can impact society at large. What if a ritual was so unsanitary it spread a biological contagion? Would that be permitted? The answer, even for Liberals, is of course no. But what about a thought contagion? What if the doctrine of a religion was so virulent that on average, one out of a thousand adherents would be seduced to act out in some physical form to comply with that virulent doctrine? Well, there seems to be no answer from Liberals about how to deal with this type thought contagion, just denial. Ironically, a "racist" or "sexist" thought contagion is attacked relentlessly by Liberals. Also, Liberals will mock and criticize a Christian thought contagion, but will not attack a "Muslim" one. If someone wants to practice their right to free speech by yelling "Fire" in a crowded theater, what do the authorities do? They stop him. They shut him down. They remove him from public places. They confine him. They extricate him from places where he could do harm. If this person belonged to a cult that commanded in their doctrine to do this, but most members did not have the proclivity to act on it, should theater employees knowingly allow members of that group into their premises without anyway of determining if one or more of those visitors intended to disrupt their establishment? And allow them in for the sake of politically correct inclusiveness? Common Sense dictates the owner of that theater has the right to deny service to help insure the safety of all his costumers, staff and property. And that owner is backed up by legal precedent. The Muslims that act on the kill commands of their holy book are at war with the U.S., therefore we must defend ourselves. So, is it constitutional to ban Muslims if an unknown, hidden element of them are at war with us? future U.S. citizens. It is beyond human capacity to anticipate every contingency. When the Founders wrote about "Freedom of Religion", apparently, they failed to make it abundantly clear if that applied to all religions, or only to religions that did not have a significant portion of their adherents bent on the destruction of the American way of life. That question was left for future generations to answer just like the meaning of the "right to bare arms" has been. Some Liberals will tell you that the "right to bare arms" only applies to militias. Conservatives say it means that individuals can have arms to protect themselves and their property. 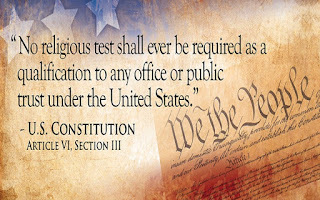 So the question is - Can we have a RELIGIOUS TEST for immigrants if there are existing religions that not only threaten national security, but have sects that have either declared war on us or engaged in war on us? Should the limit to religious freedom be where the religion in question, either fully or in part, declares or conducts war on the rest of society? For an INDICRAT, the answer is YES. The Founders said we cannot favor one religion over others. They did not address what to do if we are forced to have more circumspection towards a specific religion because it is so damn virulent. If you have 3 kids and one of them is out of control, so much so you have to send them to boarding school, that doesn't mean you necessarily favor your other two kids more. It just means you did what you had to do. We did not let Germans into our country during WWII because some of them might be Nazis. "Germany" is not a religion but the comparison applies because both Nazism and Religion are, for better or worse, forms of ideology. Why do we have to treat religious ideologues differently than political ideologues when they have declared and conducted war against us? Suppose all religions were as violent and problematic as Islam is in this day and age. Then, we would be treating them all with the same level of circumspection. There would be no accusations that we were "favoring" one, or some religions over others. This distinction illustrates that it is not our intention or purpose to treat Muslims a certain way that is different than the way we treat Buddhists, Christians, Hindus, Jews, Sikhs, etc. The fact is, we are forced, by some Muslims, to treat them differently with no prior intent of favoritism. All Islamists are Muslim, but not all Muslims are Islamists. It is the Islamists we have a problem with. If a cop smells alcohol on a driver he stopped, there's noting wrong with drinking alcohol per se, but the cop gives them a sobriety TEST to makes sure they are not too inebriated and are safe to drive. In the same, way if we know someone is Muslim we should have a religious TEST to see if they are not too radical, not a jihadist, not an Islamist, and are safe to be in our country. Immigration authorities should be allowed to examine their social media, personal connections and past activities. This would be similar to checking out why a German is entering the United States in WWII. We were at war with Nazis and we are at war with Islamists. It's that simple. because scrutinizing a person's religious fervor is not the same as favoring one religion over another. on a problematic religious faction because they forced us (in the same way that prosecutors use their discretion whether to prosecute a criminal case), then we can tackle this problem in logical and humane way that just makes sense.